Mother’s Day Deals AND Freebies! Check out these ways to save big and treat Mom this weekend! From spas to free food, there’s a lot of places doing some special things for Mom…after all, she deserves it! Baskin Robbins: The Floral Stripe Cake is perfect for Mother’s Day, and it’s $3 off in stores with a printable coupon and online with the code CAKE. Minimum $15 cake purchase is required. o For those looking to treat Mom to a home style meal on Mother’s Day (and every day in May), guests can purchase a whole rotisserie chicken for $2.99 with purchase of any family meal (valid May 1 – 31). o Boston Market is also hosting a Mom’s Month sweepstakes, giving away one prize per day in May – from Boston Market gift cards and Coca-Cola prize packages to a grand prize family vacation for four to Great Wolf Lodge (winner selected on Mother’s Day). Guests can enter once per day at http://www.bostonmarketsweeps.com/MothersMonth. BRIO Tuscan Grille: Mother’s Day brunch specials will be served Saturday and Sunday until 3 p.m. on both days. Order from the brunch menu or full menu (available all day). See details and menu. See additional details on their website. The Capital Grille: The special Mother’s Day brunch menu ($49) includes various starter, entree and dessert choices. Children’s brunch is $15. See additional details on their website. The Cowfish: Bring your mom (or any maternal figure!) to The Cowfish on Mother’s Day (Sunday, May 13) and she will receive complimentary chocolate-covered fresh strawberries after her meal. Cracker Barrel: Celebrate with Momma’s Pancake Breakfast for Mom. The breakfast includes three buttermilk pancakes, two eggs and bacon or sausage. Check location for price. See additional details on their website. Einstein Bros. Bagels: Heart-shaped bagels are available for Mother’s Day (May 13) at participating locations. Available in chocolate chip, cranberry and plain. Pre-ordering is highly recommended. Fleming’s: Restaurants will open early at 10 a.m. for Mother’s Day brunch. The three-course brunch menu ($47) will be served until 3 p.m. and includes appetizer, entree, side and dessert choices. The full dinner menu will also be available all day. See details and the menu. See additional details on their website. with the purchase of any kabob or veggie platter at regular price. The offer is valid through May 13, 2018. Plus, when you sign up, you get free hummus and pita. See additional details on their website. Hooters: On Sunday, May 13, mothers across America will receive a free entrée from the Hooters Mother’s Day Menu, at participating locations nationwide. Moms can choose from their special Mother’s Day Menu, including 10-Piece Traditional Wings, 10-Piece Smoked Wings, 10-Piece Boneless Wings, Grilled or Buffalo Chicken Sandwich, Grilled or Buffalo Chicken Salad, or Hooters Burger. The Mother’s Day deal includes a complimentary entrée from the Hooters Mother’s Day Menu, with any drink purchase, at any participating Hooters location across the U.S. on Sunday, May 13, 2018. Free menu item options may vary by location with select locations offering a buy one get one for moms in lieu of the free entrée offer. See additional details on their website. Joe’s Crab Shack: Joe’s is offering a fixed-price menu for $35.99 per person that includes a choice of appetizer, entree and dessert. See menu for details. See additional details on their website. 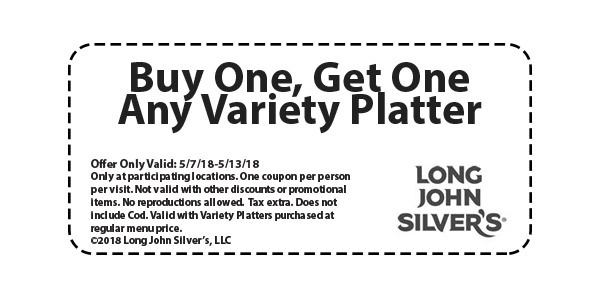 Long John Silver’s: Mother’s Day special buy one platter, get one free. Valid May 7-13. See additional details on their Facebook page. Get the coupon on their website. o On Mother’s Day (Sunday, May 13), all Macaroni Grill locations will be opening early at 9 a.m.; all weekend long, the Italian dining chain will be offering aspecial Mother’s Day brunch menu (featuring Avocado Toast, Eggs Benedict, Sweet Berry French Toast, plus a Grande Bloody Mary of Honey Bunny beverage) until 4 p.m., plus a prix fixe menu (one of four new entrées and a special sweet treat for $25 per person) all day. o All mothers who dine with Macaroni Grill will also receive a coupon for 25% off their next visit (purchase of $10 or more; valid from May 16 – June 15), plus all restaurants will feature a special Mothers’ Day backdrop for family photos. o All electronic gift cards are 25% off from May 7 – 13 using the promo code TREATMOM on macaronigrill.com. Maggiano’s Little Italy: They are offering a Mother’s Day Family Style Menu for parties of two or more until 3:00 pm. The cost is $26.95 per adult and $13.95 for ages 5-12. They are also offering a Sunday brunch on May 13 from 10 am – 3 pm. Cost is $38.95 for adults and $21.95 for kids. See additional details on their website. McCormick & Schmick’s: Locations will be offering a Mother’s Day celebration. Contact your nearest restaurant for details and see which times are available for reservations here. See additional details on their website. The Melting Pot: Participating locations will be holding special Mother’s Day meals. Check your location for details. Some locations will start as early as May 11 and offer take-home gifts for mom, special packages that include balloons and bouquets and special menu items. See additional details on their website. Mimi’s Cafe: Mimi’s will be serving a three-course menu on Mother’s Day from 11 a.m. to close. Prices start at $18.99 for adults, and kids’ meals are $8.99. Menu includes starters, main courses and choice of dessert. Reservations recommended. The closest location is in Greensboro, NC. MOD Pizza: Get a Mother’s Day surprise when you sign up for their e-mails offers. According to a company representative, the offer will be sent via e-mail soon to those signed up. Once we get the offer, I’ll update this post. Sign up at their websiteto get the offer. Morton’s The Steakhouse: Morton’s will celebrate Mother’s Day with $59 Steak & Lobster. Reservations strongly encouraged. The closest location is in Charlotte. See additional details on their website. O’Charley’s: On Mother’s Day, as on all Sundays, O’Charley’s will be serving Sunday brunch starting at 9 a.m. With various entrees (including cinnamon French toast, waffle combos and omelets) ranging from $8.79 to $14.29, your family will have plenty of options. And buy $25 in gift cards and get $10 in rewards. See additional details on their Facebook page. PDQ: Moms eat free with a purchase of any meal, bowl or salad at all PDQ locations on Sunday, May 13th, 2018. See additional details on their website. Pilot Flying J: Moms get a free cup of Pilot Coffee (any size, including iced or hot) for the entire Mother’s Day weekend (May 11-13). To get the offer, you need to download (or open) the myPilot app beginning May 11, for the offer which is valid at the more than 750 Pilot and Flying J Travel Centers in North America. See additional details on their website. Red Lobster: Spend $75 in gift cards and get 2 bonus gifts in return. See additional details on their website. Ruth’s Chris Steak House: Moms will receive a $25 dining card when they dine there on 5/12/18 & 5/13/18 and the card is valid 5/14/18 – 7/1/18. Valid at participating locations and can only be used towards a future purchase. Valid for dinner only (after 4pm). Not valid on takeout and an entrée purchase is required. In addition, select Locations open at 12 noon on Mother’s Day, Sunday, May 13th. See additional details on their website. Shoney’s: Participating locations will be offering a Mother’s Day All-You-Care-to-Eat fresh food bar. Moms get a free slice of strawberry pie. Plus, enter this Mother’s Day drawing to win a $100 Shoney’s gift card. The closest location is in Lumberton, NC. See additional details on their website. TCBY: Moms get free frozen yogurt at participating locations on May 13. See your local store for details. The closest location is in Mebane, NC. See additional details on their website. Texas Steakhouse & Saloon: On May 13, moms receive a certificate for a free entree on a future visit. See additional details on their website. Tijuana Flats: Participating locations will be offering a free entree to moms on Mother’s Day according to a response from Tijuana Flats on a post on their Facebook page. See additional details on their Facebook page. FruitBouquets.com: Coupon code BESTMOM gets you 10% off Mother’s Day fruit gifts. Godiva: Use code MDAY18 (good through April 29) to get 20% off orders over $50. Gourmet Gift Baskets: Receive 15% off any order with coupon code MOM15 (April 26 until May 13). Or, use code CHEESECAKE4MOM to get 25% off the Gourmet Cheesecake Sampler. Mrs. Fields: Use MDAY15 to receive 15% off any order until May 13. Shari’s Berries: April 16 through May 13, get 15% off Mother’s Day strawberries and sweet treats over $29. Sugarfina: For orders placed before May 6, get a free two-piece custom candy bento box with orders over $50. You choose the contents of the free bento box — options include various toffees, candies and chocolates. Use code BESTMOM. 1-800 Flowers: Order before May 11, and get 25% off select bouquets and gifts in the Mother’s Day collection. This promo is valid for delivery dates between May 7 and May 11. Use promo code MDAYERLY at checkout. FTD: Get up to 40% off Mother’s Day bouquets through May 11. ProFlowers: Get up to 40% off Mother’s Day flowers and gifts April 16 through May 11. Babo Botanicals: The natural-beauty-product site is offering $10 off any order with promo code SUPERMOM10 until May 13. Benefit Cosmetics: Until May 1, get free shipping and gift-wrapping on orders over $60 with code BENEMOM. Macy’s: Get the Philosophy 3-piece Amazing Grace Eau de Parfum Mother’s Day Gift Set for 37% off (originally $108, marked down to $68). See additional details onwebsite. Spa Week: Get 15% off Spa & Wellness gift cards (redeemable for Massages, facials, salons, manicures and more at 9,000+ locations nationwide). Enter discount code MD2018 now until May 14. Blue Nile: Get 25% off select items with code MOM2018 between April 25 and May 11. Fred Meyer Jewelers: Through May 14, get select Mother’s Day gift sets for 50% off. Jewlr: The online jewelry store is offering 15% off any order plus free shipping through May 13 with promo code MOTHERSDAY15. Kay Jewelers: Through May 2, get a discount that grows with the amount of the purchase — and free shipping. You’ll get $150 off items over $450 (code MDAYGIFT150), $400 off items over $1,250 (code MDAYGIFT400) and $600 off items over $2,000 (code MDAYGIFT600). Kmart: Use code FORMOM May 6 until May 13 to get an extra 15% off fine jewelry. Zales: Get up to 50% off Mother’s Day gifts plus free shipping through May 13. Belk: Get $10 off a $50 purchase, $20 off $100 or $30 off a $150 purchase with the coupon on their website. Valid through May 13, 2018. Plus, there are multiple 10% – 25% off coupons. See additional details on their website. Fit & Fresh: The company, which specializes in fashionable insulated lunch bags and beach bags, is offering 20% off the Mother’s Day collection through May 13. Use promo code MOM20. Kate Spade: Receive 20% off full-priced items until May 13. Use code MDAY18 at checkout. Kohl’s: Spend $50 or more on select Mother’s Day gifts (including select women’s clothing, accessories, shoes and fashion jewelry) and get $10 off. The promo is valid for one transaction in store or online between May 2 and May 13. See additional details on website. Lilly Pulitzer: May 5 through May 9, use code MOMLOVE to receive free two-day shipping on orders over $150. Lord & Taylor: Get 20% off any order May 1 through 7 with promo code MOM. Macy’s: May 8 – 10, shop the Last Chance Mother’s Day sale for 20% off a variety of gifts. See additional details on website. Nautica: Get up to 50% off Mother’s Day gifts through May 12. The Mother’s Day section includes totes, sweaters, clutches and more. Bed Bath & Beyond: Get 20% off select KitchenAid products and up to $100 off KitchenAid stand mixers through May 13. West Elm: Get 25% off items in the Mother’s Day collection May 1 through May 13. American Greetings: Personalize and print free Mother’s Day cards on their website. American Greetings: Personalize and send free Mother’s Day e-cards from their website. Coloring Pages: Have the kids print and color some cute Mother’s Day coloring pages from their website. Next The Black Dot Of Death I-Phone Bug.